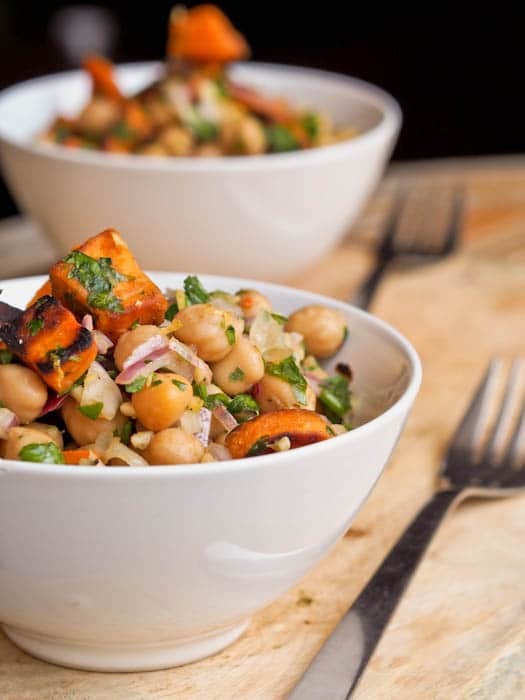 Sweet Potato Chickpea Salad – A simple and healthy filling vegan and gluten-free lunch or dinner; made with red onions, parsley and a tangy lemon dressing. Sweet potato chickpea salad is on the menu for lunch today! After almost two years of traveling abroad it feels a bit odd to back at home. Not as extreme as reverse culture shock but all of a sudden the questions have gone from where are you from. where are you traveling, to what do you do, where are you living nowadays. The dynamic seems to have changed a bit. I’m still getting the hang of things. Though it has been great to see friends and family. There’s really nothing quite like starting the weekend with the parents over oysters, crepes with caviar, and glasses of prosecco. Oh it feels good to be home. Oh and I’m super excited about all the recipes I am finally going to treat my parents too. I’ve got a list of oh about a thousand recipes I can’t wait to make. And I am so excited to have a full and I mean full cabinet of spices to work with. For the longest time I’ve only had salt to add to my cooking, so now that’s I’ve got a whole arsenal of spices, expect things to get a bit crayzay around here. Let’s start things off easy, with just a handful of spices in this sweet potato chickpea salad recipe. Vegan, gluten-free and full of flavor. Filling and simple lunch or meatless summer meal. topped with a zesty and tangy lemon cumin dressing. Flavor explosion in your mouth? I think so. This sweet potato chickpea salad is filling enough for a full meal and uses everyone’s favorite fall ingredient – sweet potatoes with some vegan protein added in with the chickpeas. Fresh herbs are a must here (though if you don’t have parsley I am sure cilantro would work here too). I love adding chickpeas in salad, just regular canned or better roasted and turned into croutons like in my vegan arugula salad with quinoa and avocado. There’s just something hearty about a salad with chickpeas in it, and when you add in sweet potatoes too it instantly becomes a full on meal. This sweet potato chickpea salad is definitely filling enough for a entree style salad. And it’s low carb too, and meatless so it’s basically the best thing you could make for yourself. No baking of the sweet potatoes here either. It’s amazing how quickly the sweet potatoes cook when diced up and pan fried. It just takes minutes. Next time I make this salad I’ll try pan frying the chickpeas too for a bit more crunch to them. 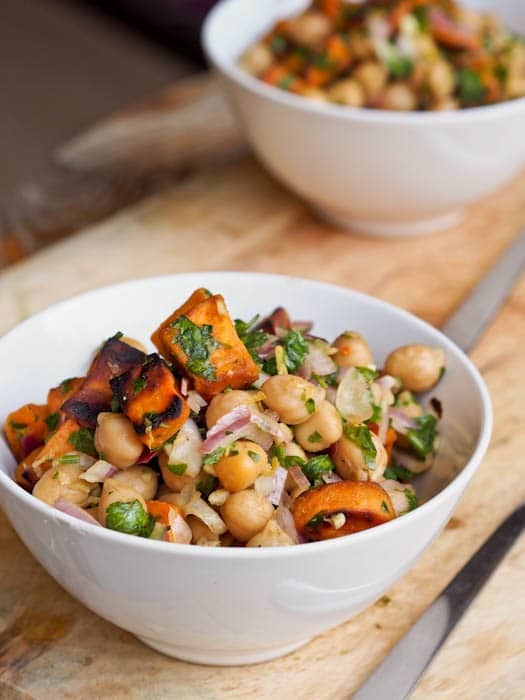 If you try making this sweet potato chickpea salad with pan fried chickpeas let me know! Also did I mention I’m obsessed with sweet potatoes nowadays? I mean I used to hate them but then something finally clicked and I realized, wow, no, sweet potatoes are actually delicious. It’s amazing how taste buds can change. I read somewhere (or did I see this in a blockbuster movie) that your taste buds change every 7 years or so, so I guess I’m still in store for several other rounds of changes. Now if you’re loving sweet potatoes as much as I am it’s only fair to point you in the right direction of a vegan sweet potato recipe. Wouldn’t want you to waste time on a bad recipe right? 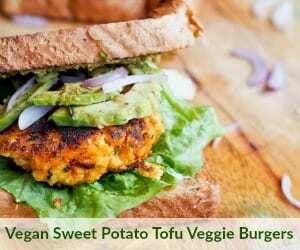 My new favorite way to use sweet potatoes is in vegan veggie burgers – the mashed up consistency is perfect for binding the rest of the ingredients together while still maintaining a soft and fluffy patty. 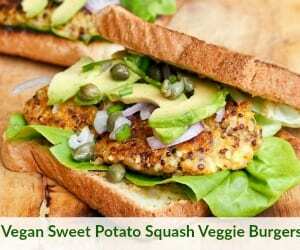 When you get a chance try out my Vegan Sweet Potato Tofu Burger, Vegan Sweet Potato Squash Burgers or if zucchini is more your jam then my chickpea zucchini burger recipe is right up your alley! Are you loving sweet potatoes as much as I am? Please please share your favorite sweet potato creations! 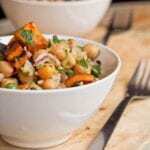 A simple and healthy filling vegan and gluten-free lunch or dinner sweet potato chickpea salad recipe. Heat pan over medium heat and add oil. Cook diced sweet potatoes until lightly browned on all sides and cooked through. Add salt, pepper to taste and half the cumin powder (1 teaspoon) . this looks like a seriously good salad, definitely will be recreating this in my kitchen. love it! Oh your parents sound like the know how to spoil you. 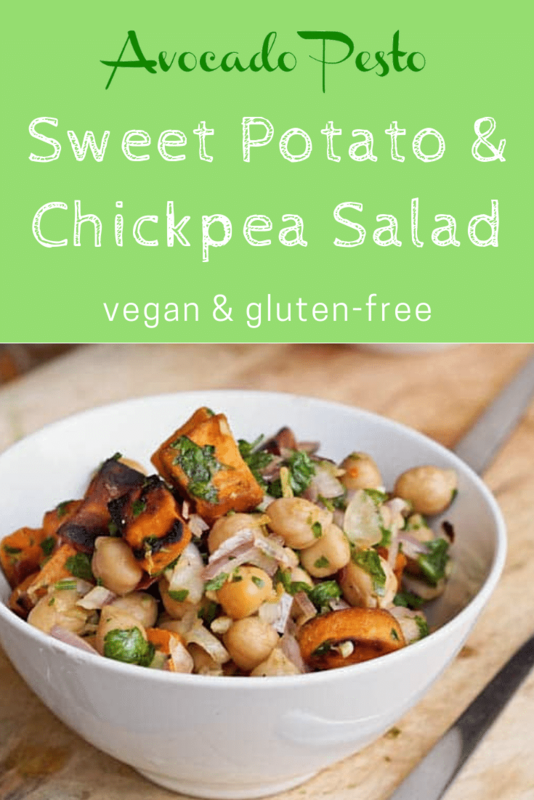 You use 2 of my fav things -sweet potato and chickpeas in this salad so I love it. Can this salad be made the day before you need it?? Hi Lauren, yes I am sure you could make this the day before! I really like the fact that there is no dressing in this salad! I often find salad recipes but they usually have a very heavy dressing. I’m making this for the week, I already had everything besides the potato. Always keep some cans of chickpeas in your pantry – they come in handy quite often! Thanks for the recipe, Vicky! This looks SO GOOD. I’m also highly obsessed with sweet potatoes right now (I don’t have any sweet potato creations on my blog yet though so I have nothing to share, sorry). I’m also trying more meatless meals to slash my grocery budget! This is great! Thanks! I recently starting loving sweet potatoes too : )) Meatless meals are still delicious and indeed cheaper! Hey! What is the serving size per person? The full recipes serves 3. I need a delicious salad that would travel well – I think that this could be the one. Perfect for a vegetarian pot luck dinner. Yes this would be the perfect one for you! The calorie count per servings if the full recipe serves 3 is 366 calories. Hope that helps! The recipe makes a huge batch and just a little was very filling! Love it! Yes it is definitely very filling! That is very helpful for me at least! I do want to point out though, your calorie counter (which I suspect is an automated plugin) is WAY off. It is saying that it is only 54 calories per serving. I don’t know how all that works, but I wanted to make sure you were aware. I did the math using sparks recipe, double checking with google calories and without the sesame seeds it comes to about 240 calories, in case anyone needs to shrink it some more. Thanks for pointing that out Sara. The calorie counter is built into my recipe plugin so I will let them know that the numbers are way off. I tried this! It was delicious! Thank you! Hi! I pinned this and bought all of the ingredients but now I can’t find the actual recipe on here! Am I missing something? Thanks! Toss to combine. Add additional olive oil (up to one tablespoon — optional). This was super delicious. I ended up sauteing the onions with the potatoes and added red/yellow peppers, jalapeno and a zucchini for some extra flavour. Great recipe! Sweet and spicy, warm and comforting! Thank you for sharing! I loved the ease of making the sweet potato in a pan. Thank you for the recipe. So Yummy! Thanks! So much quicker than in the oven right?! Sorry! Just how I made the recipe that time! Your blog is so full of ads that I quit browsing because it was taking so long to get your recipes. Good luck to you. So sorry about that Cindy! So glad to hear you enjoyed this recipe! I am in the lookout for salad recipes for dinner and am making a weekly calendar for the same. Being a vegetarian, need a protein rich meal as well and this recipe is just that. Adding this to my calendar. Thanks for this. Is it best served with the sweet potatoes warm or does it not matter? I want to meal prep this for lunch this week so if so, I’ll keep the sweet potatoes seperate to reheat and then toss when ready to eat! Thanks, it looks delicious! It doesn’t matter – they can be warm or cold. Extremely flavorful. Love the combination of spices with my two favorite foods: sweet potatoes and chickpeas! It was so easy to pan fry the potatoes. My husband actually had seconds! This will be a staple in our home as we transition to a plant based diet. Can’t wait to try some of the tweaks there have suggested. I cut the cayenne pepper and crushed red pepper in half and it was the perfect hot. I only added 1 tsp of cumin because it’s over powering. Other than that I followed the recipe. I love this stuff.. I could eat it every day.. Thanks for the kind words! Happy to hear you enjoyed my recipe!